What Could Possibly Go Wrong with Data Backup? You can find here a summary of all the products, both paid and free, and their links all on one page for your convenience. Please note that if the service or product is a paid service or product, I do make a commission as an affiliate if you click on the links and purchase the product. But there is never an extra cost to you for this purchase and in some circumstances there may be a savings to you. I appreciate you supporting this website by purchasing from my recommended providers. The free sites are links to products and pages that I think can be useful to the public. Other than an affiliate connection to the paid sites, I have no other connection to these sites and would encourage you to use your own discretion in deciding to use any of these sites and products. Identity Theft Protection Reviews – How to protect your identity! Please do not think that Identity Theft cannot happen to you. I promise you are not invisible to this world. You cannot afford to take identity theft, privacy protection and asset protection lightly. IT CAN HAPPEN TO YOU! If you wait until there is a theft, it is too late and the damage can be catastrophic before you even know it happened. Take the time NOW to put together a comprehensive plan to protect your identity, your privacy and your assets starting with a good identity theft protection service. To learn more about putting together a comprehensive identity protection plan, CLICK HERE. 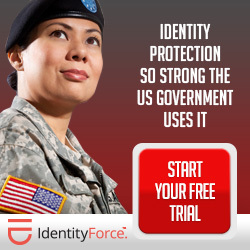 IdentityForce is an excellent identity theft protection service that will monitor every aspect of your credit profile to the extent you want it to do so. Many argue that you can do for yourself what the monitoring services do. This is technically correct, but for most people, it is not practically true. Most people are very busy with their lives and tend to neglect monitoring their credit profiles. A good identity theft protection service is not foolproof by any stretch of the imagination, but it sure helps to have another set of eyes checking for you when you are distracted and aren’t even thinking about it. To learn more about identity theft protection services, CLICK HERE. To go straight to my recommended identity theft protection services, click the icons below. Computer Security Software Reviews – Can you be safe on the internet? Your computer is the world’s portal to your most sensitive information. For this reason, your first line of defense to identity theft should be focused on your computer and your internet usage. In my opinion, every computer should have an always on, real time, heuristic anti-virus software package on their computer before they visit any sites on the internet. The key to protecting your computer and your private information is to block malware from every getting to your operating system. There are two anti-virus programs that lead the consumer industry in blocking malware using an interactive always on real time approach to blocking malicious files. These two files are Webroot Secure Anywhere and BitDefender. After taking care of that issue, the next software you need is a computer optimizing software. My recommendation for optimizing your computer to keep it running at peak performance to protect your privacy on the internet is Advanced System Optimizer 3. To read my review on computer security, please CLICK HERE. To go directly to BitDefender, Webroot or Advanced System Optimizer 3, click their respective icon below. The biggest dilemma we all have in protecting our data is deciding how to back it up. In the old days, we kept paper copies of everything. One of the great wonders of the computer age, however, is that we can keep enormous amounts of data on a very small disk. The problem is if the disk fails. For that reason, we have to have back up plans. Using cloud storage is the safest way to ensure that your precious data does not disappear forever because of disk failure. To date, cloud storage has proven to be a safe and convenient way to store and access your photos, videos, documents, etc. CLICK HERE to learn how to protect your data. To learn more about cloud storage at a very reasonable price, please click the JustCloud.com and iDrive icons below. Home Security Reviews – Prevent Home Invasion! There are numerous home security services and systems on the market. You may want to use a local service for those needs, but for those who are looking for a Do It Yourself home alarm system, check out MORzA Home Security Systetm by Brickhouse Security by clicking on the icon below. Brickhouse also offers every type of security product imaginable and at very good prices. We have all read and heard the stories of babysitters abusing the children in their charge while the parents were away and how they were caught by the “Nanny Cam.” We have also seen how the delivery drivers stole items from houses and were caught by outside security cameras. For those who think they need security cameras, Security Cameras Direct is an excellent source of finding the camera that fits your needs. To learn more about Security Cameras Direct, please CLICK HERE or to go directly to their website, please click the icon below. I was watching news in my local area that reported a home invasion that resulted in the shooting of occupants followed by the shooting of the invaders by the father who came from the back of the house. The way the invaders intruded into the house was by kicking in the front door. This is very easy to do by the average sized person on the average exterior door of homes. EZ Armor provides a device that will prevent most kick in attempts on most exterior doors. To learn more about EZ Armor, please CLICK HERE. To go directly to their website, click the icon below. It is a good idea to have a safe at home. The safe should be rated for safety and fire. The safe should also be hidden or bolted down so thieves cannot walk off with it. There are numerous safes on the market. I purchased my safe from PatriotSafe.com. The main reason I chose it was the size, safety and fire ratings for the best price. Keep in mind that the thicker the steel on the outside of the safe, the more difficult it is to breach, but the more expensive the safe. PatriotSafe.com was not the thickest but for the price, it offered excellent security and the highest fire resistance at a whopping 2 hour rating at 1880 degrees. You can also visit Fort Knox vaults at ftknox.com which offer thicker steel safes. Neither of these are an affiliate of mine and I will not make a commission if you purchase from them. I just found them to be very high quality and reasonable prices. Personal Security Devices – Leave me alone! Many people live in situations where they are always at risk of attack when they leave their home. I have included two icons below that may prove helpful to you. The first is Taser. We all know what a taser is and how it can stop a would be attacker. However, a taser may be too much for an individual who may find a stun gun to be a more practical personal defense. You can buy any taser product by clicking on the TASER icon below, but I particularly like the concept of the StrikeLight. This is tactical flashlight that also serves as a stun gun. To learn more about the TASER StrikeLight, please CLICK HERE. To go directly to TASER click on the icon below. For additional personal protection devices, check out the Brickhouse Security icon below. Below are links to services I believe can benefit my readers. These are services related to assisting and supporting those who wish to improve themselves in various aspects of their lives. The first of these links is Wealthy Affiliate. For those who are interested in learning how to build websites, where to host them, and how to make money off of their own website, the best and safest place for you is at Wealthy Affiliate. You can access them by clicking on the WA link below. Let me explain to you why this is such an awesome site. Wealthy Affiliate is a community of affiliate based website builders and marketers. It offers step by step training, a data base of answers to common questions, a community of world wide experts who can answer your questions as you get stumped. What is really cool is that they offer two programs. One is FREE. The other is a premium membership that gives you everything you need to build successful websites to earn money. There is no up selling at WA. You either have the Free access or you have the Premium access. I started WA as a Free membership. I started their basic training and began connecting to fellow members. I quickly realized that I wanted the premium membership and here is why. The premium membership is $49.00 per month or $359.00 per year. I was paying $79.00 per year to host one site and $175 per year to host another site. With Wealthy Affiliate, not only did they automate the building out of the initial website template, provide step by step up to date instructions on everything I needed to know about building websites and about getting ranked with the search engines, and providing access to real help in building my websites, WA offers unlimited website hosting for its premium members. Personally, I would have paid them $359.00 per year for the education alone and considered it a steal of a deal because of the quality of education I have received. But to get unlimited hosting on a very fast platform is unbelievable for the cost of a premium membership. If you are interested in learning how to build affiliate websites, I would encourage you to join Wealthy Affiliate’s free service and take it for a test drive. Then you can decide if a premium membership makes sense to you. To get your free membership to WA, please click the Wealthy Affiliate icon below. The following website is geared toward the do it yourself legal niche. NOLO provides a lot of free legal information as well as paid self help books and legal forms. They can even help you locate an attorney. Check out NOLO by clicking the NOLO icon below. If you have a legal question or want to know the basics of how to do things legally like how to form a business, how to buy and sell real estate, how to make a will, how to immigrate to the United States, check out NOLO. They can help you. I am not an affiliate advertiser for the below sites. I make no money from them. They are listed here because they offer a valuable service to my readers. If you like and use any of the sites and products and find them valuable to you, please consider making a donation to them if they provide a means to do so. ComboFix - (ComboFix does not currently work on Windows 8.1). If you have a hijacked computer with Windows 7 or before, go to another computer and click this link, then click the BLUE “Download Now @ Bleeping Computer” button. Download this file on a jump drive. Boot up the hijacked computer in safe mode. Insert the jump drive and download the ComboFix software. Turn off your anti-virus and run ComboFix. It will take about 10 minutes to run. It will run 50 processes and will remove all hijacking software including strongly embedded root kits. This is a free program although I am sure they would appreciate a donation. The only problem I have encountered in cleaning a computer with Combo Fix was not its fault. The rogue antivirus malware changed my networking maps, which had to be remapped after ComboFix removed this viral root kit. Please note that this is a very unassuming software. It is a basic small screen that will tell you to wait about 10 minutes while you can see the processes appearing as they are complete. The first 6 or 7 processes take the most time. It flies through the rest. It will save a log report when it is done. It is important not to do anything with the computer until you get the notice that the log report is done. Until then, it is not done and it will tell you so. The final thing you need to know is that this software is constantly being updated, which means that it will do you no good to store this software. You will need to download the latest version from this link each time that you use it. This is a miracle software. I know from using it to un-hijack computers that my employees have incurred through the years. JustDelete.Me – This is a free website that will give you the link to almost every conceivable social media site to deactivate or remove an account and its information. It will grade the difficulty of deactivation or removal from easy to impossible. Use this to deactivate or remove social media sites no longer used in order to reduce or delete your digital footprint. Federal Trade Commission (Report Identity Theft) - If you are the victim of Identity Theft, this where you should start. If you use an identity theft protection service, contact them immediately. LastPass - This is one of the best rated password managers. It is free, but of course you can purchase a premium membership for $12 per year. Paypal – signup for secure online transactions using PayPal.